﻿ Global Construction Sustainable Materials Market Report, Size & Trends 2017-2026. The global construction sustainable materials market in the terms of value is estimated to witness a healthy growth at a CAGR of 11.6% by value, and 12.0% by volume between 2017 and 2026. The increasing demand and the growth rate for construction sustainable materials in the market is attributed to their increasing usage in applications of insulation, roofing, framing, exterior siding, and interior finishing, among others, and their usage in the end-user industries of industrial construction, commercial buildings, residential buildings, and other buildings. The rising demand of the construction sustainable materials is in line with the unique properties and added advantages of the former over the conventional materials used for construction. The specific characteristics in the material providing environmental benefits, emission reduction, less energy consumption, and the potential to be recycled and reused make the construction sustainable materials a preferred choice in the aforementioned applications. The report is a compilation of various segmentations including the market breakdown by sustainable material product type, applications, end-user industry, and different geographical regions. It also includes sections on competitive insights and market dynamics. Herein, the revenue generated from the construction sustainable materials market is tracked to calculate the market size. While highlighting the key driving and restraining forces for this market, the report also provides a comprehensive section of the application areas of the construction sustainable materials market. It also examines the role of the leading market players involved in this market. • What is the size, in terms of value ($billion) and volume (kilotons), of construction sustainable materials market in 2016, and growth rate during the forecast period, 2017-2026? • What are different types of construction sustainable materials and developments by respective manufacturers? • What is the market size of different construction sustainable materials types, in terms of value and volume both, by different product types in 2016 and their growth prospects? • What is the market size of different construction sustainable materials types, in terms of value and volume both, by different end users in 2016 and their growth prospects? • What is the market size of different construction sustainable materials types, in terms of value and volume both, on the basis of different applications? • What is the construction sustainable materials market size for different regions on the basis of various product types in terms of value and volume both? • What is the market size of different applications of construction sustainable materials types, in terms of value and volume both, on the basis of different regions? • What is the market size of different end-use industries of construction sustainable materials types, in terms of value and volume both, on the basis of different regions? • What is the market size of different product types of construction sustainable materials types, in terms of value and volume both, on the basis of different end-user industries? • What are the key trends and opportunities in construction sustainable materials market, pertaining to countries included in different geographical regions? • How attractive is the market for different stakeholders present in the industry by analyzing the futuristic scenario of construction sustainable materials? • What are the major driving forces that tend to increase the demand for construction sustainable materials during the forecast period? • What are the major challenges inhibiting the growth of the global construction sustainable materials market? • What kind of environment building rating systems are prevalent to make a mark in the industry? • What are the sustainability goals that are being followed by the existing market players in the industry? • What is the competitive strength of key players in the construction sustainable materials market? • How will the market players leverage on the key developments such as new product launch, acquisitions, partnerships, and product launch, among others? • Which region will lead the global construction sustainable materials market by the end of the forecast period? The report has put special emphasis on the market share of the product type, end-user industry, and applications of the construction sustainable materials, globally. The industry analyses have also been undertaken in order to examine the impact of various factors and understand the overall attractiveness of the industry. The most often used strategy for developing a better hold on to the market has been through agreements, collaborations, contracts, and partnerships, followed by new product launches. The company profile section includes highlights of significant information about the key companies involved, along with their financial summaries and key strategies & developmental activities of recent years. Some of the key players in the construction sustainable materials market are BASF SE, Du Pont, PPG Industries, Owens Corning Corporation, Alumasc Group PLC, Bauder Ltd., Certain Teed Corp., Red Built LLC, Forbo Int. SA, Interface Inc., Kingspan Group PLC, Sustainable Materials LLC, LafargeHolcim, National Fiber, Amvik Systems, and Structurlam Products. These companies provide a broad product portfolio for specific needs and applications of the construction industry. Structural products dominated the global construction sustainable materials market by product type, with a share of approximately 61.2% by volume and 63.0% by value in 2016. The commercial buildings segment dominated the global construction sustainable materials market by end-user industry, with a market share of 34.9% by volume and 35.9% by value, in 2016. The insulation application dominated the construction sustainable materials market on the basis of application with a market share of 22.4% by volume and 22.3% by value in 2016. On the basis of geography, North America dominated the construction sustainable materials market with a market share of 34.7% by volume and 34.8% by value in 2016, followed Europe and Asia Pacific. Additionally, APAC has the highest potential to grow in the forecast period due to the presence of the emerging economies such as China and India. 2.2.1.3 The Kingspan Group Plc. A sustainable material is referred to any material that provides environmental, social, and economic benefits without causing any harm to the environment. It is used as an alternative to any conventional material that is responsible for the environmental damage, high greenhouse gases emissions, and other types of pollution. Sustainable materials replace the conventional materials, as they retain the same useful properties, and offer added advantages such as environmental benefits, emission reduction, less energy consumption, and potential to be recycled and reused. Due to these properties, sustainable materials are being highly preferred for the construction industry. The construction sustainable materials can be categorized, by product type into structural products, interior products, exterior products, and building systems. By application, the market is segmented into insulation, roofing, framing, exterior siding, and interior finishing, among others, and by the end-user industry the market is segmented as industrial construction, commercial buildings, residential buildings, and other buildings. By geography, the global construction sustainable materials is segmented into North America, Europe, Asia-Pacific, Middle-East & Africa and South America. 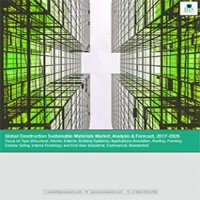 The construction sustainable materials market is driven by a number of factors such as superior properties of sustainable materials over conventional materials, stringent regulations by government, increasing sustainability goals, climate change and global warming, and growing environmental assessment methods in the end-user industry. However, high production cost, technological advancement and lack of awareness are hampering the growth of the construction sustainable materials market. Tremendous potential for growth in the construction industry, growing demand from emerging economies such as China and India, and growing urbanization and populations is expected to create opportunities for the construction sustainable materials market. The construction sustainable materials market is segmented into various product types namely structural products, interior products, exterior products, and building systems. The structural products based construction sustainable materials dominated the global construction sustainable materials market with a share of 61.2%, by volume and 63.0% by value in 2016. The market size of this segment was valued at $110.25 billion in 2016, and is projected to register a CAGR of 11.5% between 2017 and 2026. The structural products are responsible for the overall framework of the buildings, and ensure the strength and stability of the structure. In sustainable construction, the structural materials used are made up of recyclable products such as metals, concrete, and industrial wastes such as fly ash, fabrics etc. On the basis of the end-user industry, the construction sustainable materials market is segmented into industrial construction, residential building, commercial buildings, and others. The commercial buildings segment dominated the global construction sustainable materials market by end-user industry, with a market share of 34.9% by volume and 35.9% by value. Its market size is projected to reach $187.48 billion by 2026, registering a CAGR of 11.6% between 2017 and 2026. Commercial buildings and facilities are majorly responsible for emitting greenhouse gases (GHGs) during their lifetime. Their design, construction, construction, and demolition also creates a huge impact on the natural resources, environmental quality, community well-being, and worker quality, among others. Therefore, the use of sustainable materials offers tremendous opportunities for enhancing the overall sustainability of these structures. On the basis of application, construction sustainable materials market is segmented into insulation, roofing, framing, exterior siding, and interior finishing. The insulation application segment dominated the construction sustainable materials market with a market share of 22.4% by volume and 22.3% by value in 2016. Its market size was estimated at $39.05 billion in 2016 and is projected to register a CAGR of 10.8% between 2017 and 2026. Insulation is one of the primary components of green and sustainable buildings, due to the reduction in the energy usage and lowering of the overall energy cost and the carbon emissions impact, it is the dominant application of sustainable materials. On the basis of geography, North America dominated the construction sustainable materials market with a market size is projected to reach $182.54 billion by 2026, registering the highest CAGR of 11.6% between 2017 and 2026. The increasing number of LEED certified projects, along with the increasing population and industrialization are giving a much needed thrust to the construction sustainable materials market in the North American region. Another major reason behind the growth of the construction sustainable materials market in the North American region is that the countries such as the U.S., Canada, and Mexico have a strong support of the government in terms of grants, funds and subsidies, R&D activities, high investment in the construction industry and growing awareness towards environment leading to sustainability. Some of the major players operating in the North American region include PPG Industries, Owens Corning Corporation, Certain Teed Corp., Interface Inc., Sustainable Materials LLC, and Structurlam Products. Some of the key players in the construction sustainable materials market are BASF SE, Du Pont, PPG Industries, Owens Corning Corporation, Alumasc Group PLC, Bauder Ltd., Certain Teed Corp., Red Built LLC, Forbo Int. SA, Interface Inc., Kingspan Group PLC, Sustainable Materials LLC, LafargeHolcim, National Fiber, Amvik Systems, and Structurlam Products. These companies provide a broad product portfolio for specific needs and applications of the construction industry. These companies are actively aiming at an increased number of agreements, partnerships, collaborations, & contracts and products to expand their operations, thereby, enhancing their share in the construction sustainable materials market.